It is common knowledge in the legal industry that law firm offices built 5+ years ago predominantly still contain large (240 square feet plus) partner offices and typically only slightly-less-large associate offices (180 square feet). My question is: If a law firm is building out new space in 2019, will it use these same standards? The answer: Not in Washington, DC. 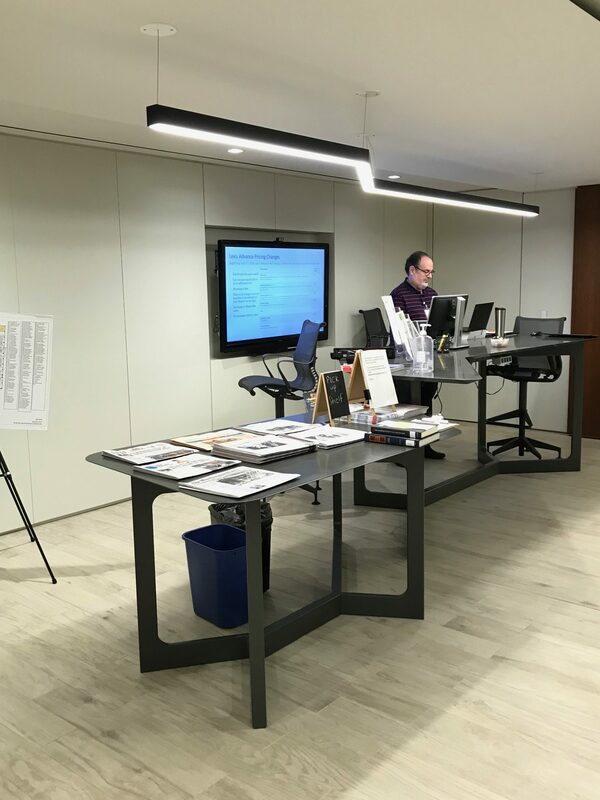 Last week, I spent a few days touring some recently built out law firm offices in DC with Gensler’s Steve Martin[i] and let me tell you: DC firms are getting strategic with how they occupy space. These firms realize that while lawyers want the privacy and quiet they associate with private offices, they are less concerned about the size of their offices. Should partner and associate offices be the same size? Traditionally, larger offices were a perk associated with earning partnership, but this perk is not without its challenges. It necessitates the regular moving of associates into larger offices upon promotion. It creates office inventory control issues resulting from fluctuating ratios of partners and associates. And, it perpetuates a hierarchy from which some firms are trying to distance themselves. Standardizing attorney offices to one size helps avoid these issues and may generate rent savings –depending on the size of the new standard office and the partner to associate ratio. For instance, if a firm goes from 240 SF partner offices and 180 SF associate offices to a standardized 200 SF office and the ratio of associates to partner is 5:1, the average office size increases from 190 SF to 200 SF. Although move costs may decrease, rent costs increase. If that same firm goes to a universal 140 SF office, there is a significant rent savings associated with a decrease in average office size of 50 SF. So a firm needs to ask the second question: How big should each office be? Office size is not solely determined by the firm’s desires. It is impacted by the firm’s leverage ratio, the window mullion width, the depth of the floor plate and other building footprint characteristics. It is also impacted by the furniture solution used by the firm. Traditionally, many firms allowed their partners to select and purchase their own furniture. Going to a smaller office size could render that furniture unusable – potentially a problem for some partners who are attached to the style and configuration of their furniture. Often when going to a new office size, a firm opts to purchase new furniture for all offices to ensure fit and functionality. 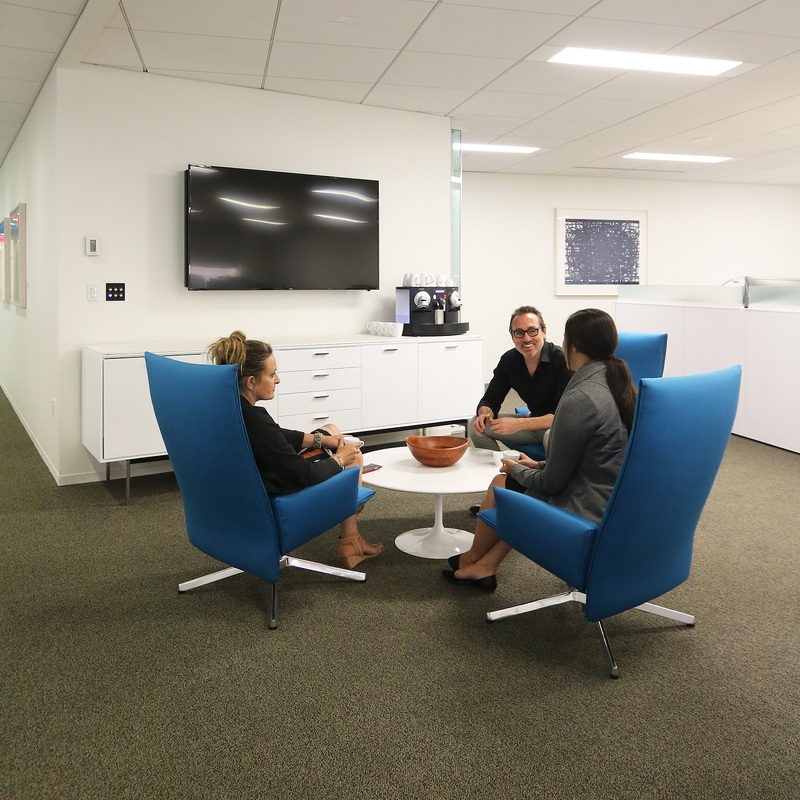 Hogan Lovells is a great example of a firm that has embraced the one-size office. 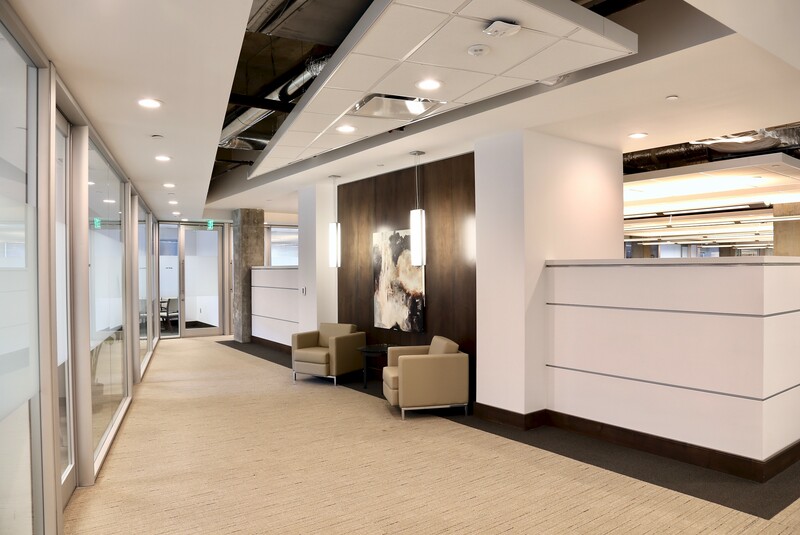 Across their offices (read about Denver here), Hogan is migrating to a standard 165 SF office for all attorneys. 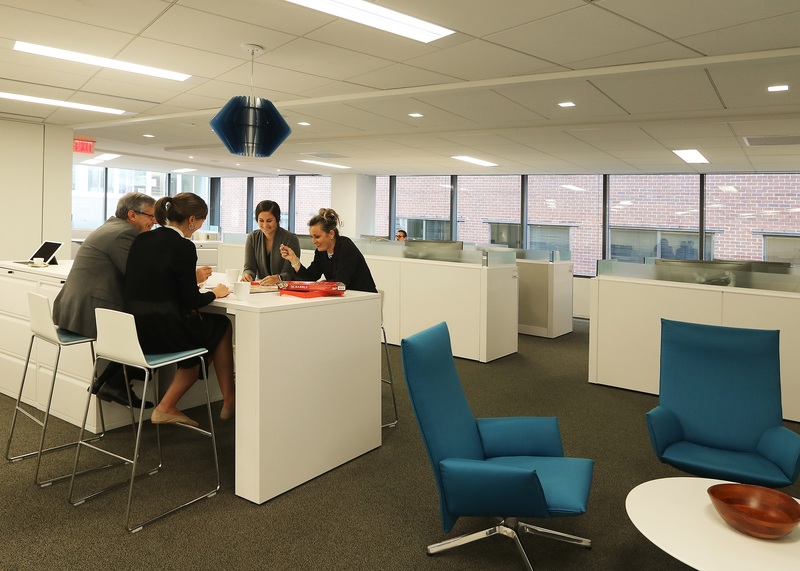 In DC, the firm worked with Gensler to use this and other space strategies to reduce its total space from 500,000 SF to 400,000 SF while increasing its attorney headcount. The firm now boasts an admirably lean square footage per attorney. How did Hogan Lovells and Gensler accomplish this? They built standardized 10’ by 16.5’ offices for all attorneys giving each attorney 10’ of exterior glass. In addition, each office has a clear glass wall facing the interior corridor. The firm’s attorneys are given the privilege of selecting the furniture solution that works best for them from a kit of options which include small sofas, tables and guest seating. Hogan Lovell’s interior offices house paralegals and other support staff and are each exactly one half the size of the attorney offices. Gensler and Hogan Lovells were very intentional in this design as it enables the firm to respond to increases in demand for attorney offices by combining two of these into one attorney office, albeit interior. Like all other offices at Hogan Lovells DC, these interior offices have full glass fronts. Hogan Lovells and Gensler also improved density and efficiency by decreasing the number of coffee stations per floor, instead building a central “hive” on each 60,000 square foot floor. [See photo at top of page.] The Hive’s intent is to increase interaction across each floor and encourage employees to get out of their offices and collaborate. Each Hive includes a high-end espresso machine, soft seating, televisions, a genius bar and a pantry. While the one size fits all option is great for some firms, it doesn’t work for others. It is especially hard to adapt when a firm is refurbishing existing space but does not want to completely re-stack. 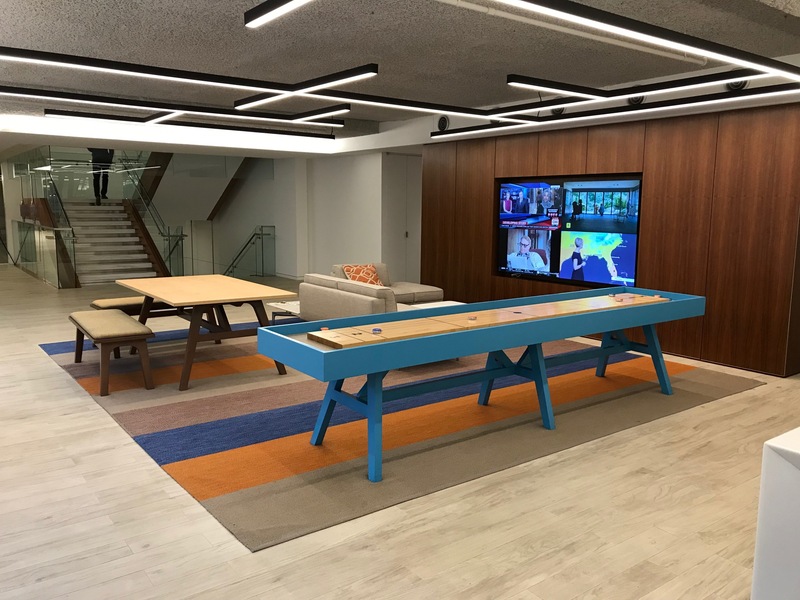 I toured another global law firm’s DC office where the firm focused on improving the public spaces but did not wish to re-stack attorney floors. Completed in 2018, this award-winning Gensler-designed space is stunning. It includes a multi-purpose room that can seat 200 around tables, a board room with a table that seats 34 and interior glass staircases connecting all three floors. In this firm’s offices, all attorneys’ offices are on the exterior glass and (prior to the renovation) had hard walls fronting the interior corridor. 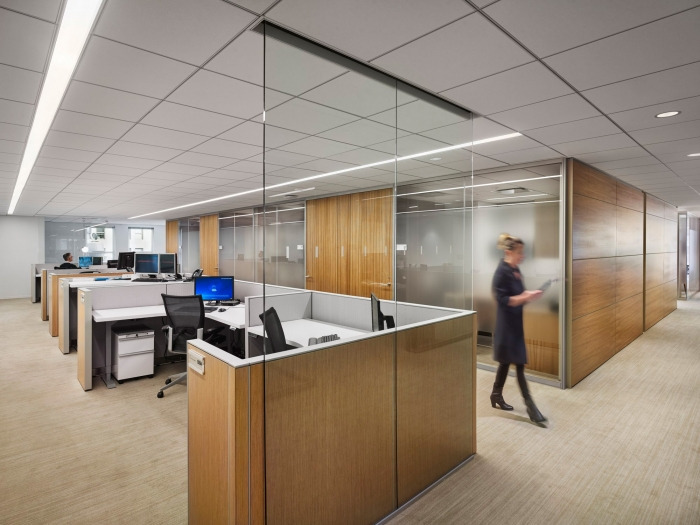 As part of the renovation, these offices were modified to include full frosted glass fronts facing the interior corridor. However, they were not resized. 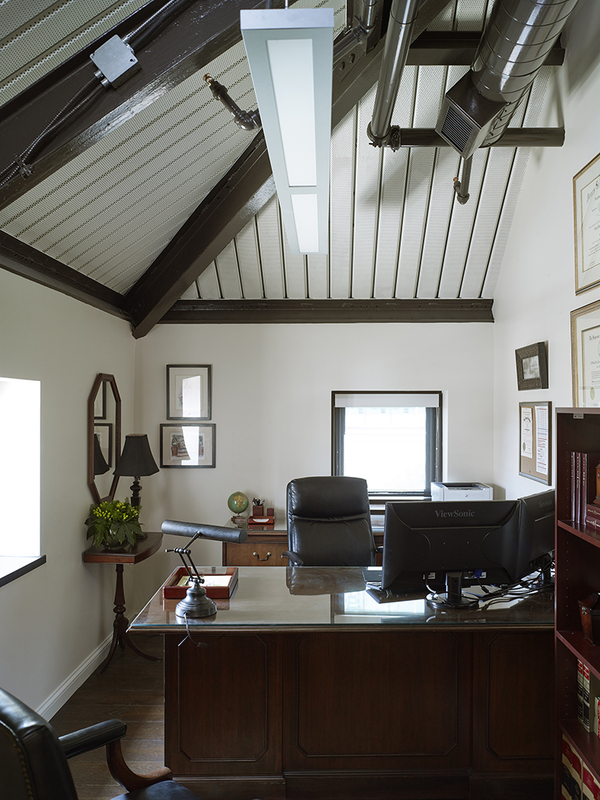 As such, the partners occupy 225 square feet offices while the associates occupy 150 square feet offices. As the firm was running out of office space, it instead chose to ask first year associates to share offices. It also asked that retired partners give up their permanent offices, instead borrowing vacant offices for a day if their needs dictate. Fried Frank was also space-challenged when it renovated its DC offices. With Gensler, Fried Frank considered different options to accommodate its attorney growth, ultimately opting against both adding space and re-stacking its existing offices (225 SF for partners and 140 SF for associates). Instead, in order to create space in the firm’s existing footprint, Gensler and the firm identified a support area that was underutilized and turned it into The Neighborhood. The Neighborhood is an open plan space with 20 workstations for summer and first year associates. It also has a small conference room for private meetings or conversations, soft seating around a television monitor, a board game shelf and a standing height meeting table. All workstations have sit/stand desks and are outfitted with curved monitors. As a final selling point, every inhabitant of The Neighborhood is gifted top-shelf Sony noise-canceling headphones upon move-in. How has the neighborhood been received? So well that the firm administrator has heard first years voice some reluctance to leave the camaraderie associated with it. The energy level is high and it is evident strong relationships are being built. A big win for Fried Frank! So, what’s happening in Birmingham? I spoke with Stephen Allen at Williams Blackstock as he has recently designed new Birmingham offices for Huie Fernambucq, Lloyd Gray and Hand Arendall. Allen said all of these firms went from very traditional and spacious hard-walled offices to more modestly-sized, light-filled glass-fronted offices. The attorney offices in these new spaces range from 115 square feet to 150, dictated by the window and column spacing as well as bay depth. The common theme is universally-sized offices for partners and associates. This promotes a more egalitarian culture while it also decreases costs associated with in-office moves. And what the offices lack in space, they make up for in light and design. New furniture is standardized and selected to provide the best working environment for the occupants. 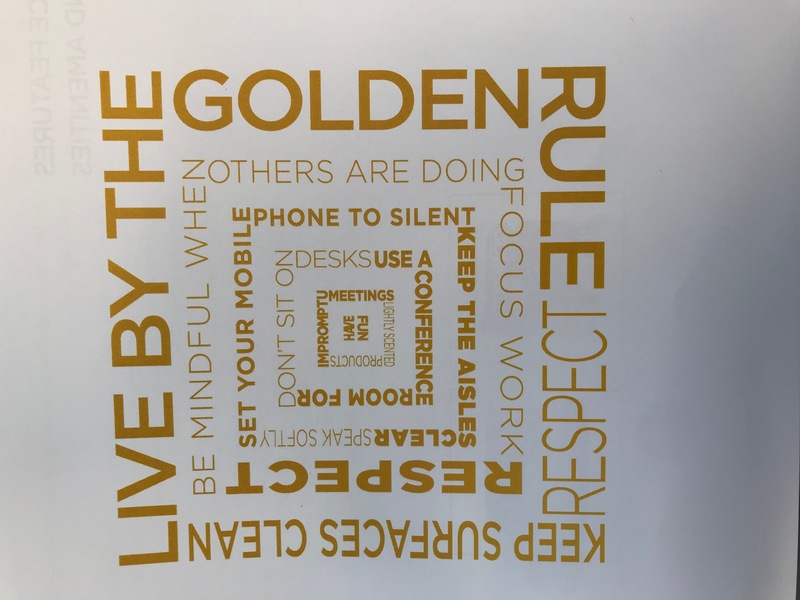 According to Allen and the attorneys with whom I have spoken at some of these firms (more on that here), the new designs have been very well received by all employees. An attorney’s clout within the firm is slowly, but surely, being dissociated with the size of their office. Also, more and more law firms are publicly acknowledging that their firm’s value is based on contributions of attorneys (both partners and associates) AND business professionals, support staff and other employees. Consequently, firms and their architects are working to design space that enables every employee to do their best work for the firm. In DC where rental rates often approach $100/SF, being smart about your space is a necessity. Firms spend money on things that generate value – which are not necessarily 240 SF offices. They use the money saved on rent to provide more amenities to their employees, recruit new talent, and/or innovate. Then they measure employee satisfaction and productivity and pat themselves on the back. Is it time for your firm to follow suit? [i] You will notice a common denominator in this post – Gensler. I am fortunate enough to have a friend in Steve Martin with Gensler, who generously took time out of his day to be my ultimate DC tour guide during my recent trip. He knows I am a geek about law firms and space utilization and he exhibits both immense patience and generosity. Would You Share an Office With Someone?